More than 600 species of grasses (out of a total of about 10,000 species) are currently used for grazing and livestock feed. Forage grasses are used as cut fodder or grazed pastures and also as harvested seed crops (generally from dual purpose food and feed crops). New accessions of Napier grass received at ILRI’s Forage Genebank from EMBRAPA in Brazil. Fodder may be given directly to livestock or after preservation as fermented green matter (silage and haylage) or as a dried product (hay, pellets and cube concentrates). These general guidelines are only indicative and specific information on different species should be sought in the literature whenever possible. Africa is the most important centre of variation in the Gramineae and most of the currently used forage grass species originated from Eurasia and sub-Saharan Africa. These species have been distributed widely into South America (e.g. Brachiaria decumbens) and Australia. Forage grasses may be annual or perennial, summer-growing or winter-growing, tropical or temperate. In addition to variation among species, there are also large differences in agronomic characteristics (such as yield and digestibility) within species. Most of forage grasses are cross-pollinated. Hybridisation, apomixis and polyploidy are common features. Most forage grasses are maintained as seeds except for a few that rarely produce seeds, such as Napier (or elephant grass, Pennisetum purpureum). These are maintained in field genebanks. There has been little research on seed storage of many forage grasses and as a result there is limited information about the storage behaviour of seeds of many species. Many forage grasses have short-lived seeds (seeds that only remain viable for a very few years) or are shy seeders (only a small percentage of the seeds have a caryopsis and will germinate). 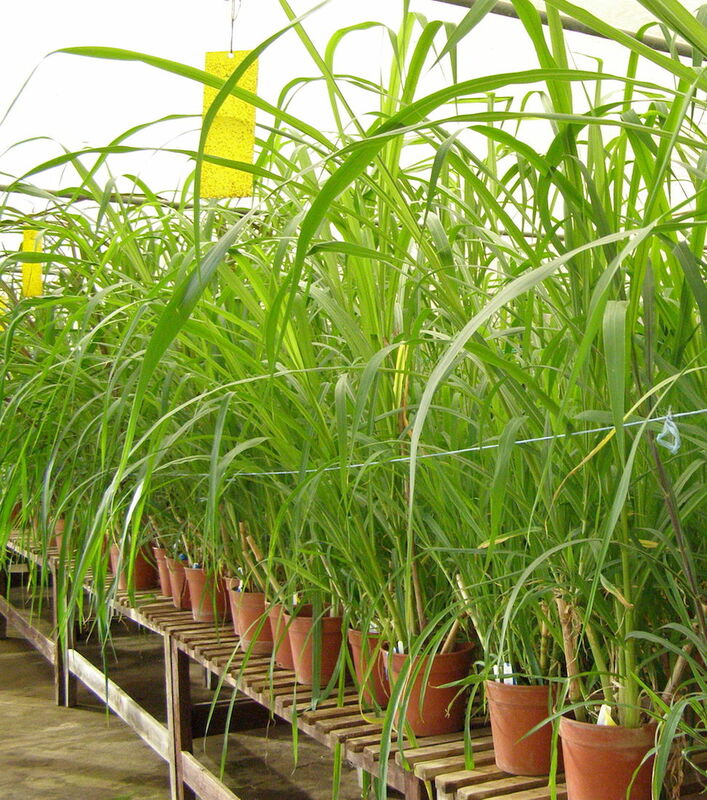 Species like Panicum maximum (short-lived seeds), Pennisetum purpureum (shy seeder) and Digitaria arianthum (shy seeder) are generally maintained in field genebanks. Some seeds of forage grass species have been found to survive more than five years of cold storage (at 5% moisture content and 8°C) without substantial loss of viability and can be stored in seed genebanks. These include Andropogon gayanus, Brachiaria brizantha, Brachiaria decumbens, Cenchrus ciliaris, Chloris gayana, Cynodon dactylon and Pennisetum clandestinum. Seeds stored for long periods in genebanks are better protected from external climatic or environmental factors that cause seed deterioration. However, during regeneration these seeds may be exposed to the risk of loss of genetic integrity from external pollen contamination, selection or genetic drift. Reducing the regeneration interval by providing the best possible storage conditions to extend longevity helps to reduce genetic change over the longer term. When species are difficult to establish or have short-lived seeds (1–2 years), the effort and cost of constant regeneration of seeds in the field is high and it usually becomes more economical, efficient and practical to maintain perennial plants permanently in a field genebank, rather than store them as seeds. ILRI’s genebank, responsible for forages and some dual-purpose crops, is housed in Addis Ababa, Ethiopia. The collection is extremely taxonomically diverse, with more than 1,000 species. The 20 most numerous species account for less than a third (29%) of more than 20,000 accessions. CIAT, Colombia, CSIRO, Australia, EMBRAPA, Brazil, IGER, UK and USDA Fort Collins, USA hold important collections of forage grasses. Chin HF, Hanson J. 1999. Seed storage. In: Loch DS, Ferguson J, editors. Forage Seed Production Vol. II Tropical and Subtropical Species. CABI, Wallingford, UK. pp. 303–315. Clayton WD. 1983. Tropical grasses. In: McIvor JG, Bray RA, editors. Genetic resources of forage plants. CSIRO, Australia. pp. 39–46. Knight R. 1983. Mediterranean and temperate grasses. In: McIvor JG, Bray RA, editors. Genetic resources of forage plants. CSIRO, Australia. pp. 48–61. Stebbins GL. 1972. The Evolution of the grass family. In: Youngner VB, McKell CM, editors. The biology and utilization of grasses. Academic Press, New York. pp 1–17. Contributors: ILRI, Addis Ababa, Ethiopia (Jean Hanson, Juvy B. Cantrell, Janice Proud); CIAT, Cali, Colombia (Daniel Debouck, Maritza Cuervo, Rainer Schultze-Kraft); Bioversity International/ILRI, Addis Ababa, Ethiopia (Alexandra Jorge). Information on genebank management of forage grasses was gathered from current genebank practices, accumulated experience, literature and websites of major forage genebanks (CIAT, ILRI, CSIRO-Australia, IGER-UK, USDA-Fort Collins, EMBRAPA-Brazil). This information was revised and validated by crop experts.